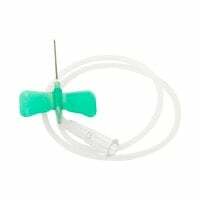 In this category, we offer you various venipuncture cannulas and safety venipuncture needles for blood drawing procedures and administering infusions. We supply you with butterfly cannulas of many sizes for use with adults and children. 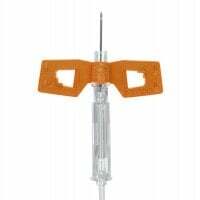 Venipuncture cannulas, also known as perfusion sets or butterfly needles, are disposable cannulas that are used for short term venipuncture. 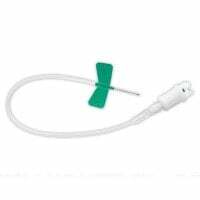 Typically, they are used for intravenous medication application, for blood drawing with thin veins or for administrating infusions. 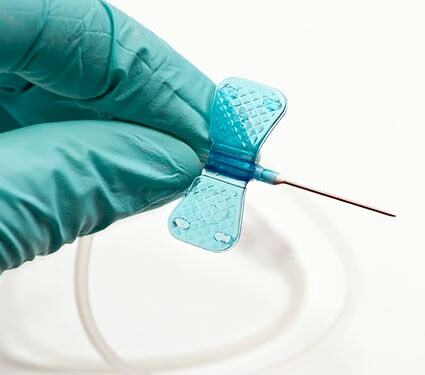 A venipuncture needle is composed of a hollow cannula, a tube with a Luer-Lock connector and 2 plastic wings, which ease the application, as well as the fastening of the butterfly needles with a plaster strip. 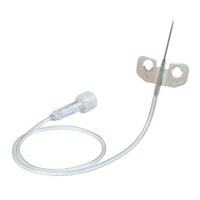 Venipuncture cannulas are also available as safety cannulas. 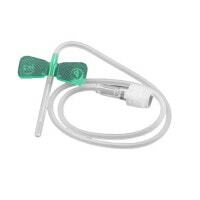 With such items, the safety mechanism is often a small tube, which can be irreversibly pushed over the cannula. 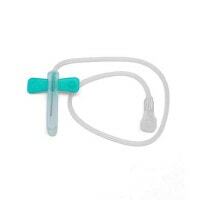 Venipuncture cannulas are available in various sizes so that they may be used for both adults and children. In order to more easily differentiate between the individual sizes, the wings are colour coded. At Praxisdienst, you will not only find venipuncture cannulas, but also IV catheters and other single-use cannulas, at affordable prices.